I've been thinking about all the changes to Paradise Pier that have been planned in the upcoming extensive rehab planned for Disney's California Adventure recently. To share my thoughts on the subject, I have come up with a little mini-series that i hope to share over the next few days. I thought I would stat off this mini-series by talking about Toy Story Mania and surrounding area since it is the first part of the rehab. Thanks to Mousetimes and Disneyland News Today for the Pictures. Lets start off by taking a look at the story behind Toy Story Mania. Disney is known for involving the guest in a story and the attraction is based off that. The queue of a ride usually gives one hints as to what the story is, but Toy Story Mania give us virtuously no hints whatsoever. There are small posters for the various games on the ride, but little about the orgin of this strange and out of place building on Paradise Pier. The Queue does (I think) wind past a talking Mr. Potato Head Audio Animatronic. In conversing with guests, he tells us of the "thrill and chills" of this midway-style attraction. This doesn't really seem relevant at the time you hear it, but becomes clearer as you venture into the loading area. 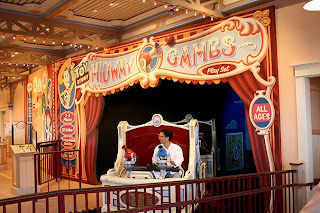 The Loading area is set up to look like you are riding through a play set, as in the picture to the left you can clearly see the words "Midway Games Play Set". This does explain why you are playing these games, but does little to explain why the ride is where it is. I guess I can't complain much, seeing as Toy Story Mania is a good step in the right direction for California Adventure, but I just feel its a little hard to understand on your first ride. Especially when you can easily tell that you have been shrunk down to the size of a toy on the East Coast version of the ride. So you went on and enjoyed the ride. Now comes the "ohhhhhh..." potion of the story as you finally understand the whole thing. Exiting into the upper balcony of the Midway Mercantile, you find a small walled off desk and chair. On the floor is a small box, not unlike the one you saw in the loading area. On the front of the box are the same words "Midway Games Play Set". 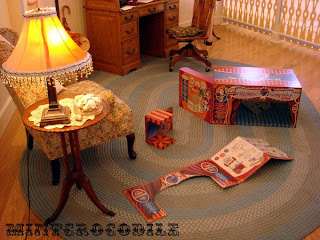 You probably then realize that this was the box the ride "came in" and the little box next to it looks like the box Mr. Potato Head came in. While realizing this, though, one may wonder as to how they got there in the first place. The story behind this little office is that this is the office of the owner of the Midway Mercantile, and that he bought the ride to bring business to the area. It explains the ride but the are itself has a story that one may or may not understand my looking at the area. But the attraction itself doesn't set the story. Sometimes, the area surrounding the attraction will factor in to where you are. The two new Outdoor Vending carts are well themed to the boardwalk and the midway, but one cart stands out as being very well themed by itself. 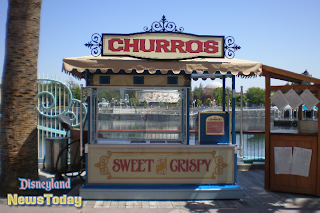 Next to this seemingly ordinary Churro cart is an old newspaper stand with a few book for sale. while obviously not for actual selling purposes, the cart is wonderfully themed with Steamboat Willie newspapers and appropriately old style books. On the other side of the churro cart is a trashcan with a shovel sanding next to it. While this may appear to be a roll-around cart with a trashcan, it actually contains a hidden sink for the churro stand. If this is the direction Disney is going with simple things like ODV carts, I feel that California Adventure is going to be transformed wonderfully into the park it should have been in the first place, as long as the budget isn't cut short on things that deserve themeing as wonderful as this. 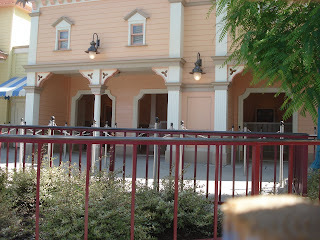 Well, thanks for coming and I hope to see you next time as I continue this series on the changes to Paradise Pier!